The other talks are PyPy JIT under the hood and to some extent Performance analysis tools for JITted VMs. This year we are also trying out a help desk. Finally, we will have the usual sprint after EuroPython on Saturday and Sunday. The cppyy module makes it possible to call into C++ from PyPy through the Reflex package. Work started about two years ago, with a follow-up sprint a year later. The module has now reached an acceptable level of maturity and initial documentation with setup instructions, as well as a list of the currently supported language features, are now available here. There is a sizable (non-PyPy) set of unit and application tests that is still being worked through, not all of them of general applicability, so development continues its current somewhat random walk towards full language coverage. However, if you find that cppyy by and large works for you except for certain specific features, feel free to ask for them to be given higher priority. Cppyy handles bindings differently than what is typically found in other tools with a similar objective, so this update walks through some of these differences, and explains why choices were made as they are. This is more natural than it appears at first: C++ classes and functions are, once compiled, represented by unique linker symbols, so it makes sense to give them their own unique place on the Python side as well. This organization allows pythonizations of C++ classes to propagate from one code to another, ensures that all normal Python introspection (such as issubclass and isinstance) works as expected in all cases, and that it is possible to represent C++ constructs such as typedefs simply by Python references. Achieving this unified presentation would clearly require a lot of internal administration to track all C++ entities if they each lived in their own, pre-built extension modules. So instead, cppyy generates the C++ bindings at run-time, which brings us to the next difference. Then again, that is not really a difference: when writing or generating a Python extension module, the result is some C code that consists of calls into Python, which then gets compiled. However, it is not the bindings themselves that are compiled; it is the code that creates the bindings that gets compiled. In other words, any generated or hand-written extension module does exactly what cppyy does, except that they are much more specific in that the bound code is hard-wired with e.g. fixed strings and external function calls. The upshot is that in Python, where all objects are first-class and run-time constructs, there is no difference whatsoever between bindings generated at run-time, and bindings generated at ... well, run-time really. There is a difference in organization, though, which goes back to the first point of structuring the C++ class proxies in Python: given that a class will settle in a unique place once bound, instead of inside a module that has no meaning in the C++ world, it follows that it can also be uniquely located in the first place. In other words, cppyy can, and does, make use of a class loader to auto-load classes on-demand. If at this point, this all reminds you of a bit ctypes, just with some extra bells and whistles, you would be quite right. In fact, internally cppyy makes heavy use of the RPython modules that form the guts of ctypes. The difficult part of ctypes, however, is the requirement to annotate functions and structures. That is not very pleasant in C, but in C++ there is a whole other level of complexity in that the C++ standard specifies many low-level details, that are required for dispatching calls and understanding object layout, as "implementation defined." Of course, in the case of Open Source compilers, getting at those details is doable, but having to reverse engineer closed-source compilers gets old rather quickly in more ways than one. More generally, these implementation defined details prevent a clean interface, i.e. without a further dependency on the compiler, into C++ like the one that the CFFI module provides for C. Still, once internal pointers have been followed, offsets have been calculated, this objects have been provided, etc., etc., the final dispatch into binary C++ is no different than that into C, and cppyy will therefore be able to make use of CFFI internally, like it does with ctypes today. This is especially relevant in the CLang/LLVM world, where stub functions are done away with. To get the required low-level details then, cppyy relies on a back-end, rather than getting it from the programmer, and this is where Reflex (together with the relevant C++ compiler) comes in, largely automating this tedious process. There is nothing special about Reflex per se, other than that it is relatively lightweight, available, and has proven to be able to handle huge code bases. It was a known quantity when work on cppyy started, and given the number of moving parts in learning PyPy, that was a welcome relief. Reflex is based on gccxml, and can therefore handle pretty much any C or C++ code that you care to throw at it. It is also technically speaking obsolete as it will not support C++11, since gccxml won't, but its expected replacement, based on CLang/LLVM, is not quite there yet (we are looking at Q3 of this year). In cppyy, access to Reflex, or any back-end for that matter, is through a thin C API (see the schematic below): cppyy asks high level questions to the back-end, and receives low-level results, some of which are in the form of opaque handles. This ensures that cppyy is not tied to any specific back-end. In fact, currently it already supports another, CINT, but that back-end is of little interest outside of High Energy Physics (HEP). The Python side is always the same, however, so any Python code based on cppyy does not have to change if the back-end changes. To use the system, a back-end specific tool (genreflex for Reflex) is first run on a set of header files with a selection file for choosing the required classes. This produces a C++ file that must be compiled into a shared library, and a corresponding map file for the class loader. These shared libraries, with their map files alongside, can be put anywhere as long as they can be located through the standard paths for the dynamic loader. With that in place, the setup is ready, and the C++ classes are available to be used from cppyy. So far, nothing that has been described is specific to PyPy. In fact, most of the technologies described have been used for a long time on CPython already, so why the need for a new, PyPy-specific, module? To get to that, it is important to first understand how a call is mediated between Python and C++. 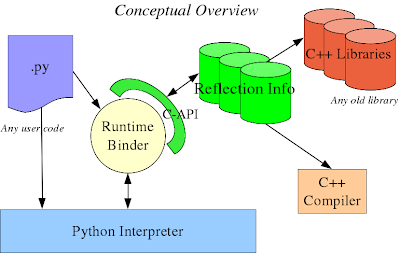 In Python, there is the concept of a PyObject, which has a reference count, a pointer to a type object, and some payload. There are APIs to extract the low-level information from the payload for use in the C++ call, and to repackage any results from the call. This marshalling is where the bulk of the time is spent when dispatching. To be absolutely precise, most C++ extension module generators produce slow dispatches because they don't handle overloads efficiently, but even in there, they still spend most of their time in the marshalling code, albeit in calls that fail before trying the next overload. In PyPy, speed is gained by having the JIT unbox objects into the payload only, allowing it to become part of compiled traces. If the same marshalling APIs were used, the JIT is forced to rebox the payload, hand it over through the API, only to have it unboxed again by the binding. Doing so is dreadfully inefficient. The objective of cppyy, then, is to keep all code transparent to the JIT until the absolute last possible moment, i.e. the call into C++ itself, therefore allowing it to (more or less) directly pass the payload it already has, with an absolute minimal amount of extra work. In the extreme case when the binding is not to a call, but to a data member of an object (or to a global variable), the memory address is delivered to the JIT and this results in direct access with no overhead. Note the interplay: cppyy in PyPy does not work like a binding in the CPython sense that is a back-and-forth between the interpreter and the extension. Instead, it does its work by being transparent to the JIT, allowing the JIT to dissolve the binding. And with that, we have made a full circle: if to work well with the JIT, and in so doing achieve the best performance, you can not have marshalling or do any other API-based driving, then the concept of compiled extension modules is out, and the better solution is in run-time generated bindings. That leaves one final point. What if you do want to present an extension module-like interface to programmers that use your code? But of course, this is Python: everything consists of first-class objects, whose behavior can be changed on the fly. In CPython, you might hesitate to make such changes, as every overlay or indirection results in quite a bit of overhead. With PyPy, however, these layers are all optimized out of existences, making that a non-issue. This posting laid out the reasoning behind the organization of cppyy. A follow-up is planned, to explain how C++ objects are handled and represented internally. We're pleased to announce the first public release, 0.1 of CFFI, a way to call C from Python. straight from the python package index (pip). The aim of this project is to provide a convenient and reliable way of calling C code from Python. write much C code (unlike CPython native C extensions). document a "struct" as having at least these fields, but maybe more). which you can manually wrap in saner-looking C functions). be relatively stable; however, minor adjustements of the API are possible. preferred way to call C from Python that can reliably work between PyPy and CPython. Right now CFFI's verify() requires a C compiler and header files to be available at run-time. This limitation will be lifted in the near future and it'll contain a way to cache the resulting binary. instead of just one :-). This binary supports the thread module and runs without the GIL. Transactional Memory (same approach as with STM, but using e.g. transaction.py module based on it is available from the sources. progress on the numpypy effort. It also brings an improved situation on Windows and OS X.
due to its integrated tracing JIT compiler. as well as our general PyPy pot. This release still implements Python 2.7.2. Improvements in cpyext, our emulator for CPython C extension modules. For example PyOpenSSL should now work. We thank various people for help. that a set containing only ints will be more compact (and faster). page for the automatic report. the API might change in the future. Use it at your own risk. JIT hooks for inspecting the created assembler code have been improved. See JIT hooks documentation for details. select.kqueue has been added (BSD). to another function now performs much better with the JIT. List comprehension has been improved. with PyPy 1.9. See the JitViewer docs for details. update. However, some interesting things happened anyway. for example the fact that unbound methods are gone in Py3k. interpreter. It tooks two days of headache, but at the end we made it :-). broken since forever on this branch. PyPy will be closer and closer.